Timed platform exclusives rarely benefit the consumer in any tangible way. They might give one particular type of console owner some kind of misguided bragging rights for a while, but it’s really only the publisher who gets anything out of the deal. 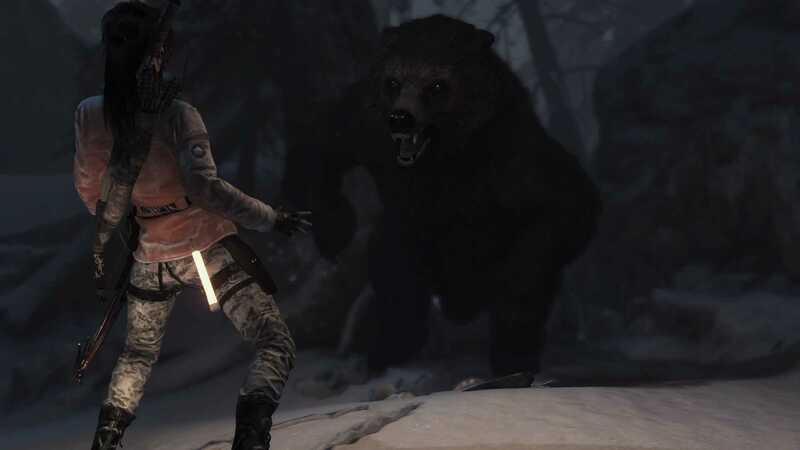 Roughly a year ago, Rise of the Tomb Raider launched exclusively on Xbox One, much to the chagrin of PlayStation 4 owners who had to endure months of gloating from Xbox gamers who felt that they were somehow the favoured group. Well, now it seems that the shoe is on the other side of their faces, since Lara’s Siberian adventure is hitting PS4 with a huge big pile of extras for the same price as it originally launched on Xbox One. Oof. Someone is feeling that one. For those who have been waiting patiently and havent had a chance to even try Rise yet, you’re in for a real treat. Stranded in the Siberian wilderness on a quest to realise her late father’s dream and find the source of eternal life, Lara faces off against a private army of highly trained mercenaries in a desperate fight for… Actually, you know what? If you’ve played any Tomb Raider before then you’ll be familiar with the setup. Like Uncharted or Indiana Jones, the plot isn’t important; it’s just a solid framework upon which to build a string of back-to-back set-pieces and gunfights. And we’re all fine with that, utterly. You see, it’s all about the adventure, the adrenaline, the razzle-dazzle. 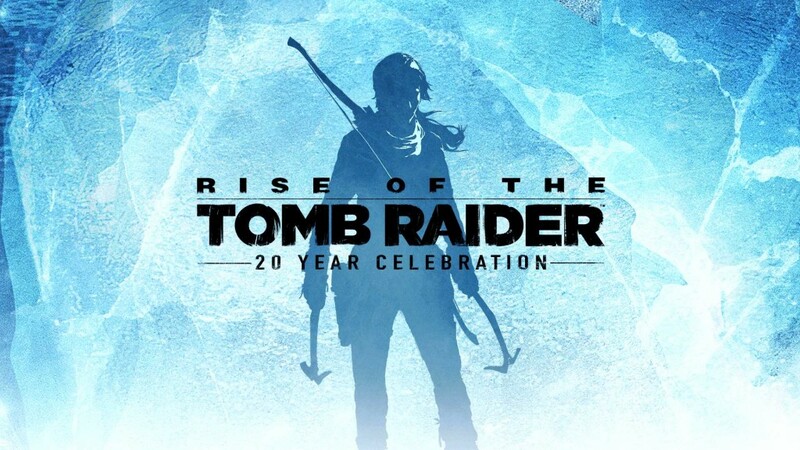 Every edge-of-your-seat moment is its own blessing, every time Lara barely survives a jump, gets slammed into a wall or floor, or almost gets shot again, you feel it in your gut. It’s action with impact; it’s what we bought the ticket for and why we’ll stay until the credits roll. If you happened to read our original Xbox One review you’ll know we loved this game at launch, and we still do. It suffers now and then from being too “gamey”, thanks to Lara’s bottomless pockets and ability to totally modify automatic weapons at a campfire with no tools, but the gameplay is just so effortlessly cool. A solid supporting cast and another star turn from Lara actress Camilla Luddington ensure that even when you’re not blowing stuff up or scaling mountains, you remain captivated. An always compelling upgrade system keeps you searching for secrets and going out of your way to rinse areas of collectibles, and the steady drip-feed of new equipment means you’ll often backtrack to finish areas off or raid that tomb you couldn’t reach before. The gameplay itself hasn’t really changed since the 2012 reboot, but it didn’t need to. 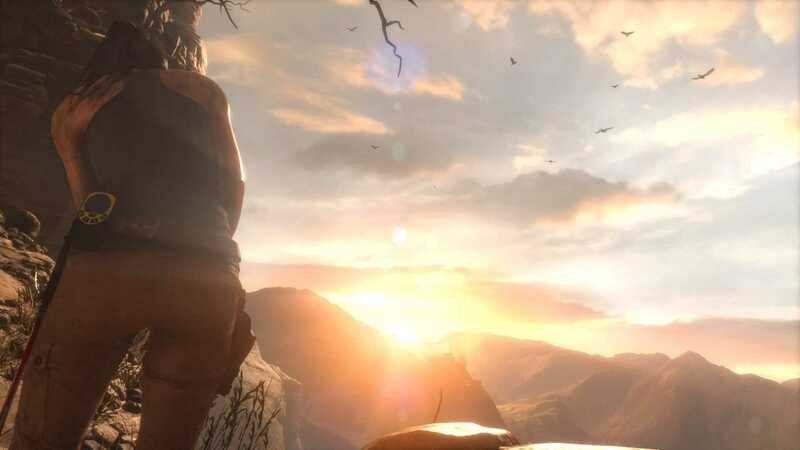 Crystal Dynamics nailed the over-the-shoulder gunplay and breakneck platforming right from the start. In addition to the vanilla campaign, the 20 Year Celebration edition also ships with the DLC. That means 14 card and outfit packs right from the off, and several pieces of add-on content including the short but excellent Lara’s Nightmare. A fast-paced zombie adventure set in Croft Manor, it sees you fending off the shambling dead while searching for three floating skulls, the destruction of which will unlock the tough final boss fight. It’s pretty creepy and very different from the campaign, which is probably why it stands out among the three DLC packs on offer. The biggest new addition, though, is the new Endurance Mode, wherein the objective is to survive as long as possible while at the same time fulfilling all your Croftian duties, such as pillaging tombs, shooting hired guns in the face, and grunting loudly when you fall off stuff. Played solo it’s fun, as you battle hypothermia and starvation that come at you with the usual survival game voracity. For example, Lara can starve or freeze to death inside a day. You need to be constantly killing animals and looking for the next source of heat it shelter if you want to survive. There are ruins dotted around that seem to be procedurally generated, and while they’re usually well guarded by Trinity soldiers and wildlife (bears, wolves, what looks like a big, pissed off lynx), they hide precious artifacts to increase your score and up your XP level. Sadly, the skills you unlock mirror the campaign rather than offer Mode-specific upgrades like cold resistance or such, but what are here are still useful. Some, like Avid Learner (earn more XP) are essential. Balancing your stats while exploring adds an extra element of tension (try fighting a bear while starving to death), and there’s loads to see and find, but it’s best when played in co-op. Working with a partner to raid ancient crypts, clear Trinity camps, or take down a rogue grizzly are activities that are as cool in action as they sound, though it would be nice if you could pick a character. As it is, you’re both Lara in different outfits, which is not only weird but distracting when they communicate. There’s no reason player 2 couldn’t be in a Jonah skin, for example. You can assign modifier cards as in the main game, and take on challenges, such as killing and eating three bears, for extra points. I experienced a few glitches with collected resources not registering, deer appearing out of thin air and bodies floating above the ground, but nothing that forced a restart or caused a crash. Minor gripes aside, the Endurance mode is a hoot and a very worthwhile addition. 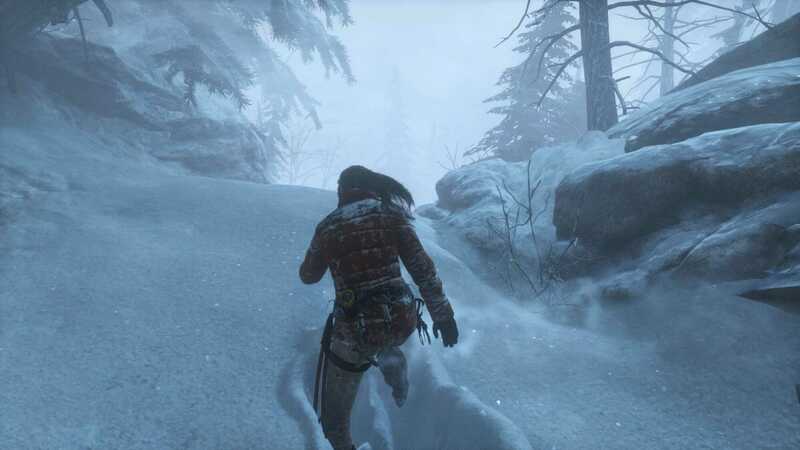 Graphically, Rise of the Tomb Raider is stunning. The animatiom is exceptional, and the beautifully rugged Siberian landscape is hugely atmospheric. In standard hi-def it looks beautiful, but on a 4KTV with HDR turned on, it’s just next-level beautiful. Of course, coming to PlayStation means Square has been able to add VR support, and rather than being the expected, tacked-on extra, it’s a story that lets you explore Croft Manor, delving into the secret tunnels, and finding out info about the history of Lara’s family. It offers direct control (left stick to move) and warp movement (you aim somewhere and warp there), and, while it’s the attachment to Lara herself that finds you wanting to play more, it’s a decent experience on its own. Picking up artifacts and finding the hidden detail is enjoyable, and the lighting gives a distinctly creepy air to Croft Manor, despite it apparently being your home. The VR mode also gives people who’ve played the game before a new reason to buy again (aside the co-op), because this is an experience you can’t get on the original Xbox version. It’s fair to say that the PS4 of Rise of the Tomb Raider is something incredibly special. One of last year’s best games comes complete with a stack of DLC, a whole new co-op mode, VR support and 4K visual wizardy as standard. It was already brilliant without all those things, but if you buy a cake and they offer you extra icing, you don’t say no. There’s simply no denying that this is an exceptional package, and although it may be a year overdue, it was absolutely worth the wait. There's simply no denying that this is an exceptional package, and although it may be a year overdue, it was absolutely worth the wait.